#6-04 - Fabulous antique mechanical stacking ball rack by the Brunswick Company. Vertical stacks of balls are released by pushing the button at the bottom center. 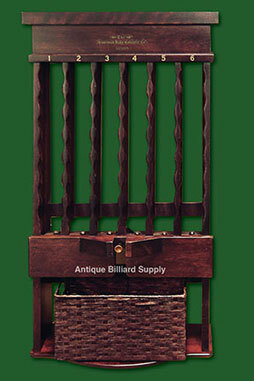 Includes correct replacement wicker basket used to catch the balls and carry them to the antique pool table. Early example with "Patent applied for" decal at top center. Dark cherry color. Excellent working condition.